Over the past several decades, video games have gone from a niche hobby to a multi-billion dollar industry that has taken over the mainstream. Video games are the entertainment medium of the 21st century, helping players to hone problem-solving skills, hand-eye coordination, and creative thinking through interactive storytelling and compelling level design. When one looks at the game design industry, it becomes clear that the most successful game designers are avid players themselves. Games have the added value of stimulating creativity, artistic expression, and play. Simply put, you have to play video games to make video games and at New York Film Academy’s Video Game Design Camps for Teens, today’s players learn how to become tomorrow’s developers. Built around the philosophy of learning by doing, students are immersed in the study and practice of games from day one. They learn not only what makes good games great, but also how to lay the groundwork upon which to create a video game of their own. 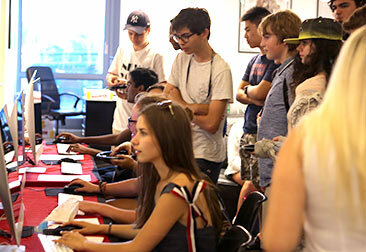 Held at the Film Academy’s New York City and Los Angeles campuses, NYFA’s Game Design Camps also teach students systems thinking, which is one of the most crucial competencies of this century and refers to understanding how systems impact and work with one another, often within a larger system. Systems thinking is also the foundation for understanding things like science, technology, engineering, and math (STEM). Offered in both one-week and four-week modules, students enrolling in NYFA’s Game Design Camps live and breathe the study and practice of playing and designing games. Students gain experience learning and working with a variety of industry-standard software through which they learn the fundamentals of 3D design. As both camps are extremely hands-on, students can expect to accomplish a great deal in a short period of time. In the one-week camp, students are introduced to the craft of writing and designing games with the week’s work culminating in the creation of an original game design document, which is the reference for designing an original game. In the four-week camp, students not only create their own game design document, but take it even further to build a working digital prototype of their game. If you think a future in game design might be the path for you, enroll in one of NYFA’s renowned Game Design Camps in Los Angeles or New York City and gain first-hand experience in designing video games. 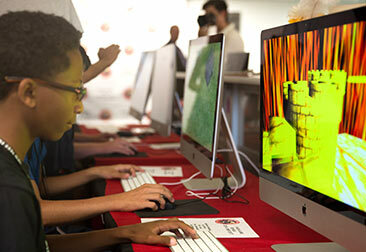 Click here to apply to one of our Game Design Camps today!